DURANGO CITADEL AWD! REAR CAM & DVD, MOON, NAVI, 3 ROWS, 24 SERVICE RECORDS. CHECK OUT THE VIDEO! ARJ'S AUTO SALES IS PROUD TO PRESENT THIS ONE OWNER CLEAN CARFAX 2013 DODGE DURANGO CITADEL AWD. SLEEK AND STYLISH IN A BLACK METALLIC EXTERIOR THAT OPENS TO A CHARCOAL LEATHER INTERIOR. GREAT CONDITION WITH 24 SERVICE RECORDS AND EQUIPPED WITH A MOONROOF, NAVIGATION, REAR CAMERA & DVD, PUSH BUTTON START, BLUETOOTH AND STEREO CONTROLS ON THE STEERING WHEEL. FOUR HEATED SEATS, AND A HEATED STEERING WHEEL ARE EXTRA COMFORT FEATURES. THREE ROWS CAN BE CONFIGURED FOR PEOPLE OR CARGO. OUTSIDE, YOU HAVE SHARP CHROME WHEELS WITH GREAT TIRES. A 5.7L V-8 AND AUTOMATIC AWD HANDLE WHATEVER YOUR NEEDS ARE. WE WELCOME ALL OUT-OF-STATE BUYERS AND TRADE-INS. AIRPORT, BUS AND TRAIN STATION PICK-UP IS NO PROBLEM!!! 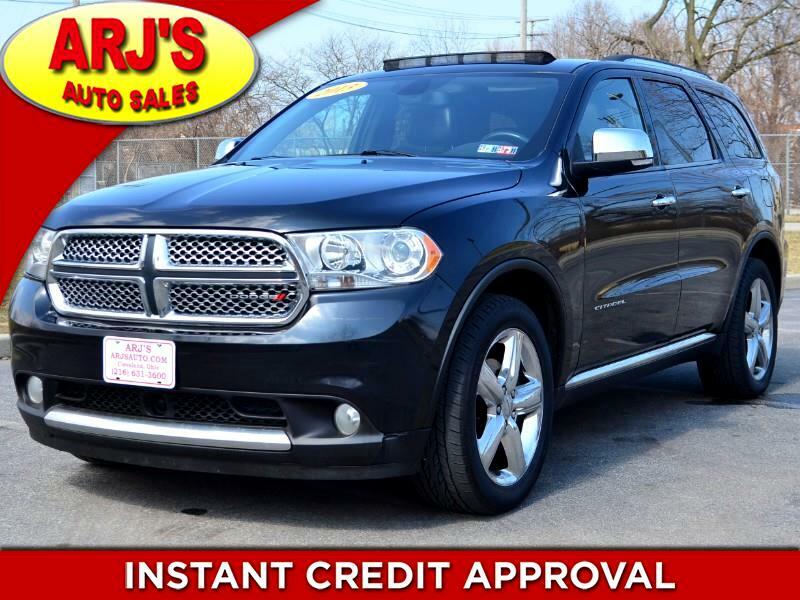 FOR MORE INFORMATION AND TO SEE THIS DODGE, CALL 216-631-3600.